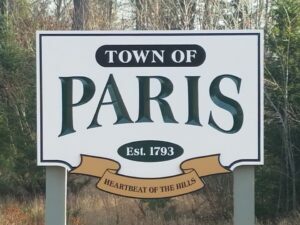 PARIS — Paris is waiting to hear how much its insurance company will pay for damages to the Fire Station caused by last week’s heavy rains. “Right now it’s a waiting game,” said Town Clerk Elizabeth Knox. Deputy Fire Chief Mark Deputy Blaquiere said a portion of the Fire Station was damaged Thursday, Jan. 24, when heavy rains backed up pouring into the meeting room side of the building at 137 Western Avenue. Blaquiere said the heavy rains and ice on the ground caused water to back up between the fire station and an adjacent private gym, located across the side parking lot, and rush into the door by the meeting room, running into several back rooms some which contain sleeping areas. “There was no place for it to go so it went to the weakest part,” he said of the water that ran under the door and into the building. Officials say there was damage to the floors and 12 inches of drywall in the workout room. It took firefighters, with assistance from Oxford Fire and Rescue more than an hour to get the water out of the building using a wet vac floor machine and several personal wet vacs, he said. Service Master was later called in to pull up rugs and remove damaged drywall. Blaquiere said the town’s insurance company has been in to assess the damage. The heavy rains also damaged other buildings in the area. Oxford Fire responded to a report of water damage in a vacant store front leased by Rightstart Inc. for its coat room on January 24.